Does Sifting Make a Better Cake? Our contributor, Summer Stone of Cake Paper Party, is back today with a new baking science experiment. Join Summer as she challenges a traditional baking concept and shares her results. BAKING ASSUMPTION: It is necessary to sift or whisk dry ingredients together. To sift or not to sift, that is the question. Most recipes call for either sifting or whisking together your dry ingredients before combining them with the other ingredients. I wanted to take a look at the necessity of these practices and see what types of differences these methods made, if any. 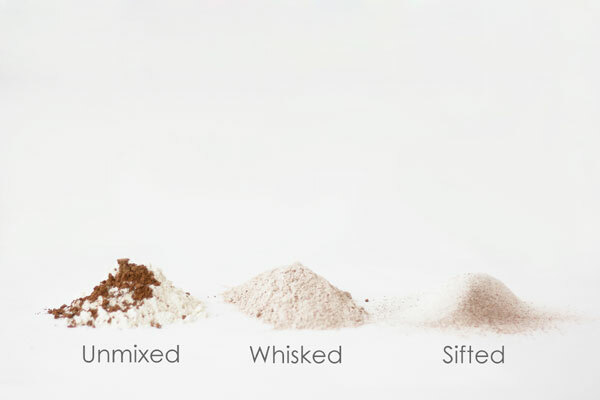 Let’s take a quick look at how whisking and sifting affect dry ingredients. 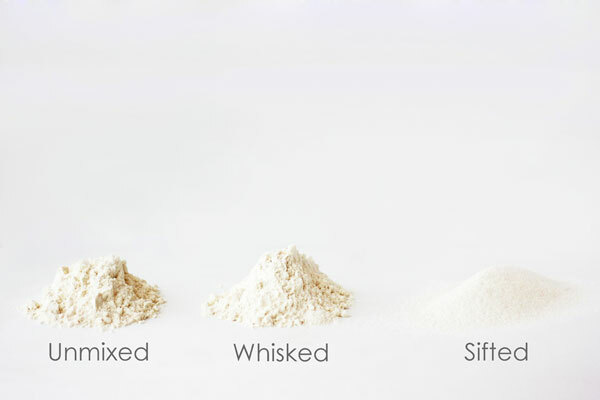 The image above illustrates the how whisking and sifting affect the texture of the flour. When flour is whisked, wires separate flour particles an aerate mixture. Similarly, when flour is sifted the grain particles are separated but to a much finer degree due to the close proximity of the wires in the mesh. As the flour falls from the sieve it becomes aerated. Whisked flour is slightly more smooth and uniform than flour that was unmixed and poured directly onto the board, but the texture of the sifted flour is incredibly fine and fluffy. An additional reason for whisking or sifting flour is to incorporate and distribute dry ingredients such as salt and leavening agents throughout the flour. To illustrate the effectiveness of either method, I added cocoa powder to the flour and left them unmixed, whisked them together, or sifted them together. As you can see, whisking is the most effective way to distribute ingredients. The cocoa is evenly and uniformly spread through the flour after approximately 20 strokes of the whisk. While sifting improves distribution of dry ingredients, the cocoa fell in almost alternating layers and predominately to one side of the sifted heap. Now let’s look at what this means in an actual cake. I have to admit that I don’t usually whisk or sift my dry ingredients together. I generally sprinkle them into the mixer bowl which contains butter, sugar and eggs. I have assumed that a good period of mixing following the addition of dry ingredients is enough to evenly distribute them throughout the batter. It was time to put my assumption to the test. For this comparison, I creamed the butter and sugar, added the eggs, flavoring and liquid and then divided it into thirds. To the thirds I added unmixed dry ingredients, whisked dry ingredients or sifted dry ingredients and mixed them each for 1 minute on medium speed. The cakes were then baked at the same time. What I found was that cakes were surprisingly similar. The cakes that were unmixed and whisked were difficult to differentiate. The most marked difference between the two was the top crust of the cake. The unmixed dry ingredient cake had a mottled upper crust while the whisked cake had a smooth, uniform top. They both had a similar texture, lightness and mouthfeel. 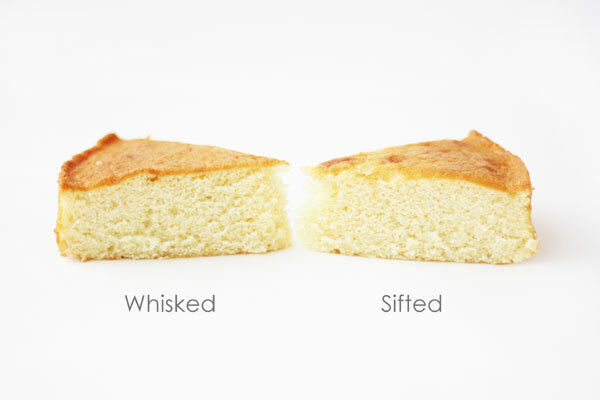 The sifted cake on the other hand was a tad bit finer in texture, but once again the difference was negligible. The thing that surprised me the most was that the sifted cake was a little drier than the whisked or unmixed cakes. It would seem that by separating all of the flour clumps, more surface area of the starch was exposed absorbing more fat and liquid making the cake seem a bit more cottony. 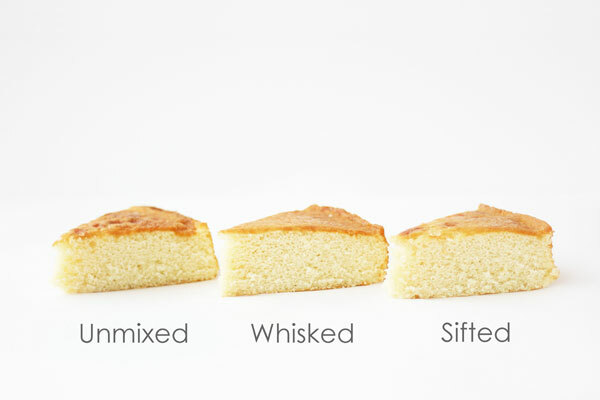 It appears that the separation of particles, exemplified by sifting, has more effect on the cake than the distribution of dry ingredients, on which whisking proves the superior method. So which technique is the best for your cake? That depends on your preferences. If a very fine cake texture is your goal than it may be beneficial to sift. If moisture is more important to you, you may want to skip the sifting process or add fat and liquids to compensate. 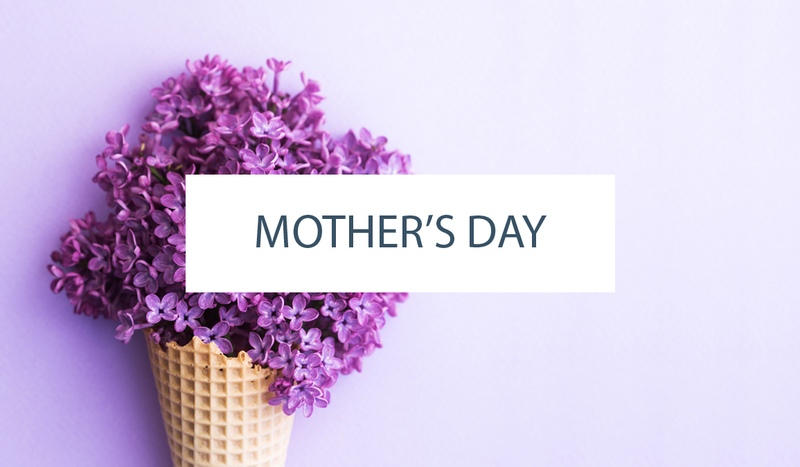 If you minimally mix your cakes after the addition of dry ingredients, it would be advisable to whisk your dry ingredients together before adding them to your wet ingredients. But if you mix your batter for a minute or more after the dry ingredients are added, whisking is probably not critical. That’s the beauty of cake; you get to choose! I hope this has informed the way you add your dry ingredients. Summer's love of baking and science, plus a bit of a rebellious spirit, leads to all sorts of crazy experiments in the kitchen and beyond. She also blogs at CakePaperParty.com. Read more about Summer on her bio page. Thank you so much for performing this test! I’ve always wondered whether sifting made a noticeable difference. I haven’t sifted flour for sweet baked goods since I took a cupcake class at Butter Lane in New York in 2010. The baker told us never to sift for sweet bakes. Their cupcakes were so moist that I figured they must know what they’re talking about. Nice to see the effects in these photographs. I’ll continue not sifting, but maybe whisking if I want a smooth top. I never sift flour for butter based cakes. I have found that sifter flour for cakes with oil in them though, or else the final product ends up with clumps of flour! 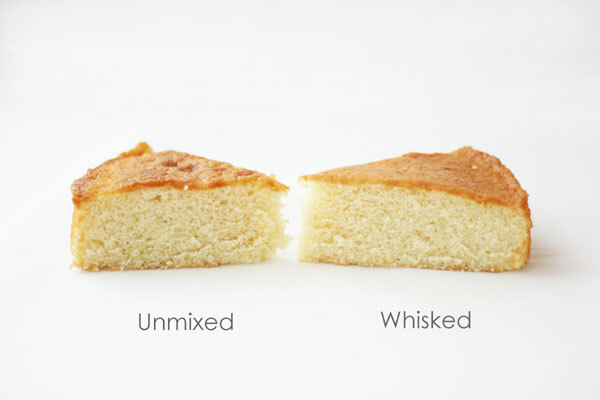 I prefer the texture of the whisked cakes just by experience. I don’t sift unless the recipe asks me to do so, otherwise I love the fluffy airiness that I’ve found whisking gives my favorite cakes. I feel the tops bake nice and smooth this way as well. Plus I just love how fluffy it makes the dry mixture before I add liquids… lol, I’m a dork like that. I am so glad you did this experiment and explained the findings! I live at 5,000 feet elevation and had read in a high altitude book never to sift or use cake flour but it didn’t state why. Then to add to the confusion, most baking videos, blogs, articles, books, etc are written by people in lower altitudes and/or locations with much higher humidity so they seem to always sift and even stress the importance of sifting. Now I know! And I even understand why an extra egg is helpful as well! I love your posts as I am also a bit of a baking science geek. From what I have learned and in my experience, whisking/sifting the flour only makes a difference depending on the type of recipe, i.e. creaming method vs. chemical aeration vs. mechanical aeration. Recipes that really do benefit from sieving are the mechanically aerated type (i.e. when air bubbles put into the batter by physically whisking the eggs, separated or whole). These include whisked sponges, genoise and roulades. These batters are relatively unstable. If the flour is dropped into the mix without sieving, it risks knocking much of the air out of the batter. Also, you will be left with clumps of flour and/or cocoa in the cake. Best to add the flour in several steps by sieving over the batter only until the pile of flour shows some cracks on top of the batter, then fold in a little and repeat. It is also important to fold these batters and not over mix. For cakes that use the creaming method (creaming the butter and sugar before adding the other ingredients, e.g. Victoria sponge), it makes very little difference as most of the aeration happens in the creaming step and the air is pretty stable in the batter. It doesn’t tend to get knocked out by adding the flour directly and the flour particles tend to get evenly coated with the fats. So long as you don’t over mix the flour (activating too much gluten and making the cake chewy), the result is a lovely fluffy cake. For chemically aerated cakes (CO2 bubbles made in the batter by chemical reaction between acid and alkali, e.g. red velvet cake/ muffins/ recipes using bicarb plus a mild acid like buttermilk or honey), it can be helpful (but not always essential) to sieve the dry ingredients together, especially if using cocoa, to ensure even dispersal in the batter. It’s probably more important to get the batter into the oven before the air starts to rise out of the cake mix though as it isn’t as stable as a creamed recipe. That’s how I work anyway. I hope that all makes sense! This is such an interesting experiment! I’ve never sifted my flour, but I do quickly whisk together my dry ingredients for even dispersement, and I’ve always wondered if I should sift. Do you have any posts like this comparing AP flour and cake flour? I usually use AP flour because I can buy it in bulk at Costco, but I’ve wondered if I should use cake flour. It’s just that it’s only available in small boxes at the grocery store and is more expensive. I’ve also read that several parts of AP flour and cornstarch can be combined for a result that’s similar to cake flour? Thank you SO much for this! I have always wondered why some recipes called for sifting and others did not and what difference it really made. Wow! Thank you so much! This is going to save me a lot of time and effort (I dislike sifting a lot!) I really enjoy your kitchen experiments!!! Thank you for this. I usually skip the sifting and go for the whisk instead, so I’m glad to hear that I’m not screwing up my cakes! Haha! Totally, too much effort! I can’t decide if those dated tips had to do with the equipment they had at the time or if someone just propagated unwarranted ideas that stuck around. I guess that is why I am always challenging convention. I want to know for myself and share what really works! I always sift the flour regardless any type. I also always bake my cupcakes with cake flour (for fluffier texture) & often find it tricky to bake properly for great moisture & texture. Yesterday I whisked the dry ingredients as posted, baked as usual & the dark choc cupcakes turned out extra moist with much better texture to hold the shape (without the very slight sink in center & weird or distorted shape). Thank you so much for your science & culinary knowledge. Now more baking for my other cupcake recipes … Happy dance! this is a great time saver and I really don’t enjoy sifting so thank you so much for the great info! For the longest time I didn’t bother to sift my dry ingredients. Now I do it all the time and it is a pain in the hiney sometimes. I’m happy that you shared this. I’ll probably still sift if I’m using cocoa and it’s good to know that the sifting police won’t come knocking at my door! Thank you for the article! I use a lot of bulk ingredients and I always sift! For example, I use a high quality cocoa powder and find there does tend to be lumps. I would have to overmix the batter in order to get the lumps out, so sifting is a requirement for us! Thanks so much for these awesome science tutorials! They are so helpful! I’m baking my own wedding cakes next spring and I’ll hope you have more out in the meantime . 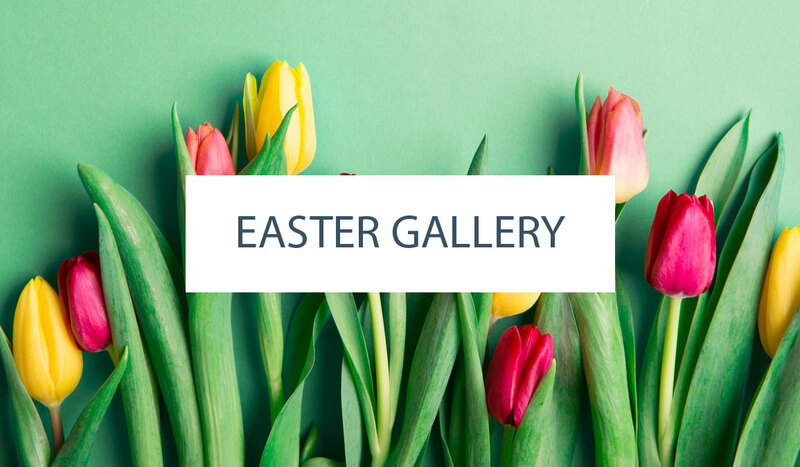 Just stumbled onto your blog via Pinterest. Love love love the science/baking experiments! 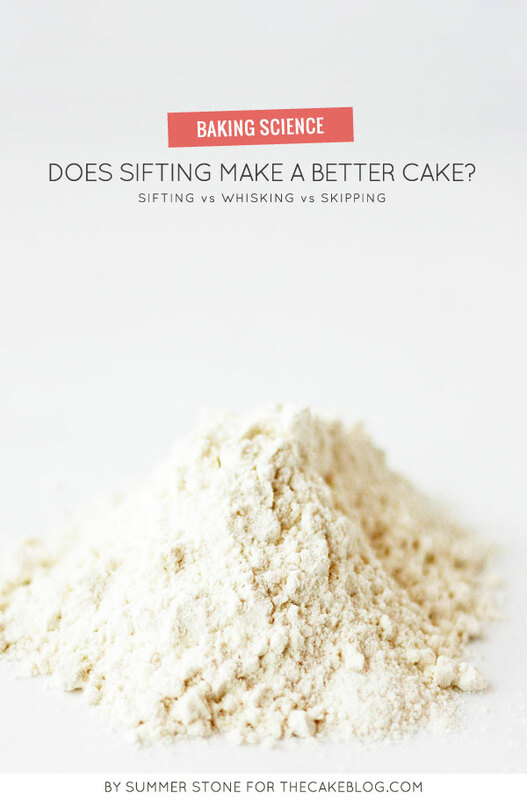 This is fabulous info, I was just baking my 10th batch of carrot cake cupcakes in the last two years, tweaking it each time to get closer to what I was trying for, and wondering – what difference does whisking vs. sifting make? I usually sift, but tonight I whisked. I was also wondering why CIA has a recipe that starts out 450 for 10 min then lowers to 350. Your other article at least showed the different affects temps from 300 to 400 have on a cake, so I can begin to guess what changing the temperature half way through would have. I love learning the science and logic behind baking, I do lots of similar experiments to what your blog covers – to learn, but moreso to get to the “ideal” of whatever it is I’m baking. That was really helpful! I used to sift my dry ingredients but started getting a bit lazy! I find that,as long as the big clumps are broken up, then the mix is absolutely fine! I have a concert, sifting makes a difference when measuring, some recipes said 1 cup of flour and the instruction require to sift, other said one cup of sifted flour, so should a measure before or after sifting if I decide to sift. Hopefully I make my question clear, so I can get help… thank you very much! Wow Amanda! I know I’m late to this conversation but wanted to say Thank You!!! I’m 45 & about to be a mom again after 20yrs so it’s more important than ever for me to start cooking & baking again for health reasons. I was never a domestic Goddess like my mother but I admire & have total respect for the role of the family caretaker/nourisher. Stumbling on your post & Summers blog has given me much needed inspiration. I would live in a chemistry lab over a kitchen any day but i now see that I can do both as the science geek side if me has been stimulated. Thank you ladies! :))) You have helped me more than u know today. Many Blessings! Sifting 3 times was drummed into my head in Home Economic class. To this day I whisk, then sift 3 times. Notice too the sifted cake is more level. I’ll never understand why anyone would want to bake a cake that forms a huge mound in the middle that cracks open like a volcano. Then cut off the entire top and toss in the trash as if that’s the normal way to bake a cake and prep it for decorating. What a waste of money and time. I’ve never had to level a cake. My grandmother and her friends never had to hack off the tops of their cakes either. They thoroughly sifted the dry ingredients as well. I believe the 30 seconds it takes to sift thoroughly is a factor in a cake baking level.